License Shield SDK only takes you a few minutes to set up. All you have to do is to install it in your system and run the setup until the DLL file is registered in your system. Then, in your software's initialization stage (load event or create event of main form), determine your parameters - set your product's name, company, copyrights, your product's purchase page, algorithms, license and trial mode etc. There's no need to write more codes (Encryption algorithm) - just call several methods in your codes and License Shield SDK will set it all up for you. License Shield SDK can be easily integrated into common development languages, such as C#, VB.NET, Visual C++, Visual Basic, Delphi, C++ Builder, Visual Foxpro, MS-Excel, MS-Access, Clarion etc. With License Shield SDK, you can easily set your free trial duration, customize register window messages, and add URL links to your website's purchase page. This keeps users from illegally copying your product and directs them to buy licensed copies. Registered version can be deployed or redistributed FREE, NO additional runtime fee needed NOW! Free Download | Buy Now! Allow you to generate license keys in bulk and integrate these license keys into e-Commerce providers to achieve sending the license key automatically. Allow you to set free trial duration in your application, such as expired date and limited runtime. Allow you to customize register window messages and add URL links to your website's purchase page. This keeps trial users from illegally copying your product and directs them to buy licensed copies. Protect applications developed in C#, VB.NET, Visual C++, Visual Basic, Delphi, C++ Builder, Visual Foxpro, MS-Excel, MS-Access, Clarion and much more. 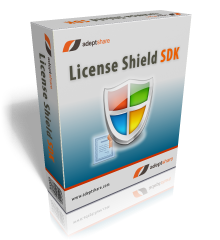 Royalty free, Use License Shield SDK in your applications with no need to pay any royalty fees for distribution. Support Windows NT4, Windows 2000, Windows XP, Windows 2003, Windows VISTA, Windows 7, Windows 2008 R2. Support Windows 32-bit and 64-bit. 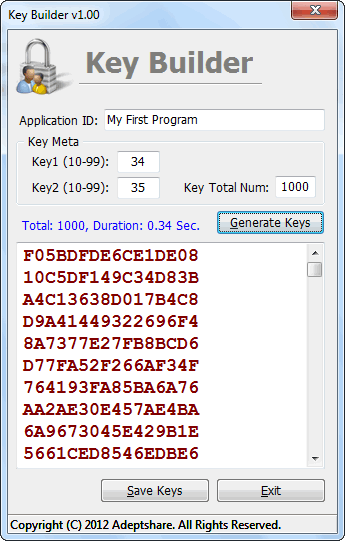 Using KeyBuilder utility, you can generate unlimited number of randomized activation keys depending on algorithms you use , so license keys collection generated (for example) by SetAppKeys('My First Program', 34, 35, 1000) will differ completely from one generated using SetAppKeys('My Second Program', 33, 92, 1000) and differ from any other algorithms.